Hiking gaiters are not the kind of critters that stalk and eat hikers. Those are gaitors! And I don't recommend that you go out and get a pair. make you feel like a long legged gazelle as you stride up the trail. Gaiters are some of the best hiking gear money can buy! Can you spot them in the photo below? They don't have to stand out unless you choose a color that contrasts with your weatherproof pants! Having lunch, just me and my hiking gaiters! Not all gaiters flow from ankle to knee, as mine do. Some are just ankle length, and others just slip over a hiking shoe. alpine (good for not only hiking but snowshoeing, rock scrambles, and dicier weather conditions). I have to confess that I've had the same pair of hiking gaiters since - are you ready for this? 1995!! That's because they're made of durable material, lightweight and breathable, and they stand up to abrasions and moisture in an amazing fashion! However, lately I've had my eye of women's gaiters, like these. Because I'm short, my gaiters sometimes pool around my mid-calf. A version made for shorter female legs might be in my future! There are also really short versions, for hiking in dusty terrain without creating unnecessary heat on your legs. These are appealing, don't you think? Wanna know my favorite part about gaiters? They're a cinch to get on over my boots, and I love Step 2 below because of the great noise it makes. Be sure my boots are laced up properly and my hiking pants are not hung up on my socks. Rip apart the front of the gaiter, which is secured with a velcro-like strip (one side is sticky, the other sticks). Put the gaiter around my leg, and make sure the instep strap is accessible because I'm going to pull it underneath my boot and secure it on the other side. Because my gaiters are so ancient, I don't have a buckle to secure the instep strap (just a toggle), but you will! Some straps are made of thin materials, pricier models will be made of durable leather or synthetics. These straps take a lot of punishment beneath your boot, so I recommend that you aim for durability. I secure the top of the gaiter to my knee area by pulling on a buckle similar to a hiking pack buckle (although there are straps and toggles available as well). Check to be sure I'm all snugged up - I don't want to defeat the purpose of the gaiters by allowing mud or snow into my boots or pants legs. Here's where I think women's gaiters might be just the ticket to a great trail experience because they have less material. My hiking gaiters have lace hooks, where I can secure the front of the gaiter to my boot. It provides an additional way to keep unwanted "stuff" out of my boots. Repeat with the other leg, and I'm all set! Do I recommend that you wear gaiters? But only if the weather and trail conditions dictate their usage. If you're just out for a day hike on a dry but not dusty or gritty trail, they'll make you hot and provide no value. But if you're uncertain about trail conditions (it rained yesterday, right?) or know you'll be crossing a few streams and mud holes, throw a pair into your pack. If you'll be in continuously sandy, gritty conditions you want to keep that junk out of your footwear. Gaiters to the rescue! And if you're a snowshoer, keep the snow out of your boots with... wait for it... gaiters! So are you with me on this? Gaiters weigh next to nothing, but can really keep your boots and socks dry, clean, and debris free. I always put them on at the trailhead if it's a moist morning, or even a beautiful summer day. Brush and blow downs along the trail, wet with morning dew, won't annoy me. And my feet stay dry! Happy feet are the secret to great hiking! 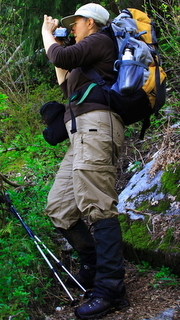 What every well dressed woman on the trail needs: elegant full length hiking gaiters!